Stork Delivery/Set Up & Pick Up at end of rental period. Small charge for delivery outside 20 mile radius from San Jose. It’s a wonderful way to “Welcome Home” baby and new parents. At end of Stork Stopped Here birth stork rental period, the new parents keep the beautiful hand-painted keepsake plaque (and the stork is removed). 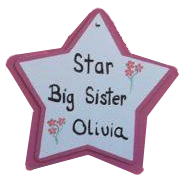 Our San Jose Stork Stopped Here keepsake plaque (22″x29″) displays baby’s name, weight, length and date of baby’s birth and makes a decorative addition to the baby’s nursery. If you have questions, please call us! (408) 773-6242 – We’re fast! good! and friendly! San Jose, Willow Glen, Campbell, Sunnyvale, Santa Clara, Mountain View, Cambrian Park, Los Gatos, Almaden, Cupertino, Palo Alto, Los Altos, Saratoga, Monte Sereno, Milpitas, Fremont. A small charge for deliveries outside our immediate area of 20 mile radius from downtown San Jose. 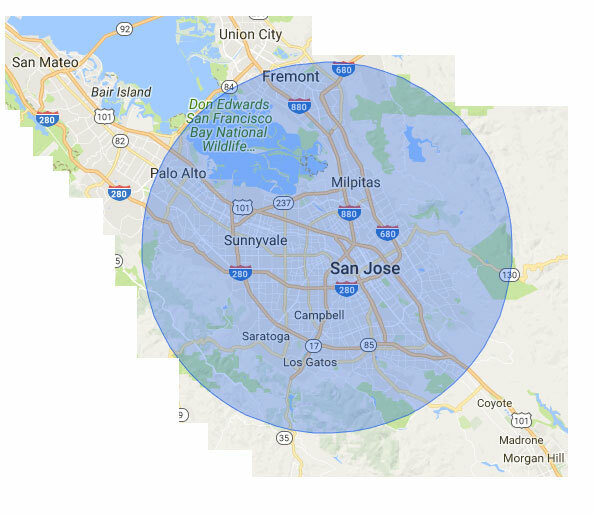 Please call for a price quote for deliveries in the following areas: San Carlos, Redwood City, San Mateo, Morgan Hill, Union City. Reserve your stork rental delivery in advance or you can even call from the hospital. When YOU deliver, WE deliver! **Delivery area available for Shower Storks only in blue area (see map).